Select the service you want to add questions to. Click on the ‘Questions’ tab. 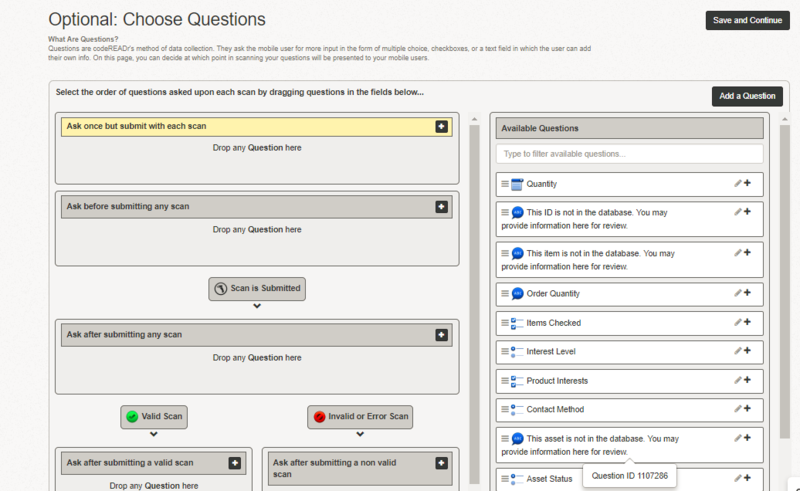 Drag any of the questions from under ‘Available Questions’ to under any desired section to assign. Click ‘Save and Continue’ when you’re finished. Ask Once but Submit with each Scan Prompts for data collection once before scanning begins. Ask Before Submitting any Scan Prompts for data collection after a barcode has been scanned but before it has been processed. Ask after Submitting Valid Scans Prompts for data collection after a barcode has been scanned, processed, and exists against a database in validation services or well formed in recording services. Ask after Submitting Invalid Scans Prompts for data collection after a barcode has been scanned, processed, and does not exist in a database, is marked as invalid, or is a duplicate scan. You can also create Custom Questions and Custom Conditional Questions, the more advanced requiring your own developer or quoted by our development team.